The new Smart ForFour ED is the all-electric version of the popular city car. It seats four people, looks great and has an official range of 96 miles. As ever, it also has a keen sense of fun, with Smart offering lots of scope for personalisation. It costs more to buy than the standard model, but running costs are super duper low and there’s lots of standard kit included. However, a high purchase price and steep monthly PCP costs mean there’s plenty to weigh up. OSV takes a closer look at what it’s all about with our 2018 Smart ForFour ED review. There isn’t much to gripe about the way the Smart ForFour ED drives. Its 60kW electric motor develops a fairly modest 80bhp, but because it delivers all of its power in an instant, it always feels brisk and zippy. This is exactly what you need in urban settings and, thanks also to the car’s light steering and tight 9.0-metre turning circle, the ForFour ED is right at home in towns and cities. It’s just as agile as its petrol-powered sibling. The 0-62 sprint is dispensed within a matter of 12.7 seconds, which looks sluggish on paper. Again, you have to remember that, because the car delivers all of its power instantly, it feels quicker than those numbers suggest. 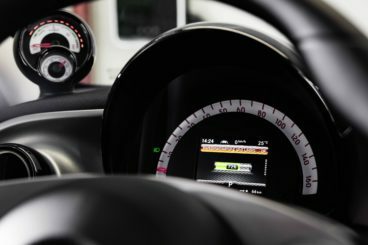 As such, the Smart car makes light work of pulling away from traffic, junctions and roundabouts, and takes just 5.5 seconds to complete the 0-37mph dash. Moreover, there is 160Nm of torque available which helps with sprightly performance in and about the towns and cities. Ride quality is good, and the car is also significantly more composed than a Smart ForFour has been in the past. Lumps and bumps are for the most part nicely smoothed over, although you will still feel a crash if you hit a bigger pothole at speed. On the whole, the car is a lively, entertaining companion that will keep you company on the commute to work, as well as weekend outings. Smart has tried to make the cabin as upmarket as possible. They’ve also tried to make it look and feel like a conventional car, and to a large extent, they’ve succeeded on both fronts. Although buyers might squirm at the sight of one or two harder plastics here and there, quality, on the whole, is good. Leather upholstery comes as standard, as do heated front seats. The fixtures and fittings are the same ones as used in the standard model, although the pod dials on the dashboard here are new. The materials, on the whole, are of a high quality and feel robust, while a 7” infotainment system is slick and easy to use. If comfort is a priority of yours, we’d recommend overlooking the optional 16” alloys and sticking to the standard wheels. Insulation, meanwhile, is okay but buyers might want to specify a £500 winter pack as it comes with upgraded interior insulation. Is the Smart ForFour ED practical? It’s not the most usable car in this class, and – as its name suggests – there’s no room for a fifth person. Rear seated passengers aren’t treated badly at all though, and wide opening doors makes access easy. However, anyone over six feet will feel cramped on longer trips. The boot measures 185-litres, which makes it one of the smallest in this sector. It’s fine for shopping trips but some buyers will find themselves needing more room. Folding the rear seats, however, extends capacity to an impressive 975-litres. Standard kit is good, with all models getting a basic but easy to use sat-nav system, a 7” infotainment system, leather upholstery, a two-piece panoramic roof, heated front seats, electric mirrors, LED daytime running lamps and halogen LED headlights. The aforementioned winter pack, which primes the car for colder conditions, making it cosier, is a useful £500 optional extra. As well as extra cabin insulation, it also nets you heated rear seats and a heated steering wheel. Other optional extras include an electric drive design pack, which for £600 gets you 16”alloys and a white radiator grille among other goodies. In terms of how safe the car is, it scored 4/5 for its crash test performance with Euro NCAP. Prices for the new car start out from £21,415 and rise to £22,010. For more information on our leasing deals, check out our page here. 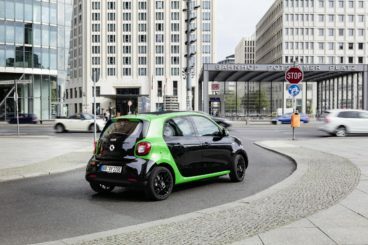 In terms of its running costs, the Smart ForFour ED’s electric motor is powered by a 41kWh battery pack which Smart claim has an official range of 96 miles. Restoring the battery from 20% to its full power takes 6 hours if you use a domestic power socket. However, you can purchase a 7kWh ChargeMaster HomeCharge unit for £350, and this restores the battery to 80% capacity in just 2 hours and 30 minutes. Cables for home charging and public charging, meanwhile, are included in the purchase price. The car emits no emissions, has a BiK rating of 9% and is exempt from both the London Congestion Charge and road tax. With a tight turning circle, light steering and a zippy motor, it’s tailor-made for urban settings. The Smart ForFour ED emits no emissions and does its bit for the environment. It’s a very smart car (in more ways than one) that comes with lots of luxuries, such as heated front seats, halogen LED headlamps and leather upholstery. Its official range is 96 miles, but expect it to be lower than that during the colder months. However, even 96 miles is well behind what its rivals are now managing. All electric cars are pricey, but given its size and limitations, buyers might think £21,000+ is a little too much. Let’s see how the car fares against its rivals in the comparison section of our 2018 Smart ForFour ED review. Smart ForFour ED vs Volkswagen e-Up! The new Volkswagen e-Up! is the all-electric version of the popular city car. It’s just as cute, just as cheerful, but much cheaper to run. As one of the most easygoing and entertaining city cars around, the Up! has proven to be a smash hit with buyers. The e-Up! then, has a lot to live up to, but would it crumble under the burden of the heavy battery pack? Despite being some 200kg heavier than the standard model, the e-Up! feels just as light. Precise steering means it’s great in the city, while body roll is well controlled. It’s nippy too, with its 81bhp electric motor having enough oomph to get you from rest to 62mph in 12.4 seconds. And because all of its power is delivered at the snap of your fingers, it’s able to zoom away from traffic with ease. That said, buyers should be careful not to push it too hard, as doing so will cause its claimed 99-mile range to drop away quickly. On the whole, its driving experience is the same as its standard sibling. The only real difference is the electric motor, a regenerative braking system and a lack of noise. Running costs? As always with electric cars, the e-Up! barely costs a dime to run. It emits no CO2, has a BiK rating of 9% and is exempt from the London Congestion Charge and road tax. Its official range of 99 miles is modest, and when the weather is colder, its range will be even less. Inside, Volkswagen has tried to justify the e-Up!’s higher purchase price than the standard model with more standard kit. However, it feels and looks a lot like its sibling. A steering wheel that only adjusts up and down could frustrate, but the driver’s seat is supportive and plenty adjustable. The suspension setup is good too, and smooths out most road surfaces. Insulation is excellent. 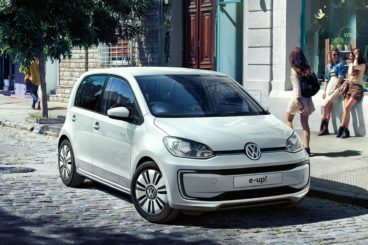 Is the Volkswagen e-Up! practical? It shares the same dimensions as the standard model and is no less practical. Unusually for an electric car that isn’t purpose built, it also gets the same-sized boot as its conventional sibling. It measures 251-litres, but it also gets the same high loading lip. The rear seats can be folded completely flat and doing so increases total load capacity to 951-litres. Boot aside, neither VW Up! or this e-Up! is super duper practical. The rear seats are tight and this is strictly a four-seater car. The Renault Zoe might be all-electric but it’s just as useful as a conventional supermini. It’s roomy, well-equipped and safe, with Euro NCAP awarding it 5/5 for its crash test performance. On the road, the Zoe feels pleasantly relaxed. Its steering is light and accurate and its electric motor barely makes a peep. This electric motor is brand new for 2018 and boasts an extra 16bhp over its predecessor. It feels zippier and has a 0-62 time of 13.5 seconds. Like all electric cars, its power is delivered instantaneously so that it feels quicker than its numbers suggest. Combined with the light steering, its burst of pace makes the Zoe well suited to urban settings. The car comes with a regenerative braking system that saves energy which would otherwise be wasted and boosts range time. Thanks to its compact dimensions and raised driving seat, the Zoe is easy to park. Running costs? With a starting price of £22,670, the Renault Zoe is one of the cheapest electric cars to buy. Buyers can choose to pay for it upfront along with the batteries, or they can pay less upfront and lease the batteries. This means there’d be a set fee to pay each month. How much depends on the length of the contract and their expected annual mileage; if it’s less than 4,500 miles per year, a £60 monthly payment is required. 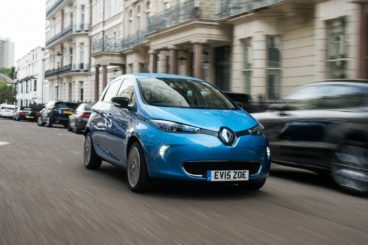 Renault claim the Zoe can keep going for 250 miles on a single charge, but in real-world conditions we reckon 186 miles is a more realistic figure. Inside, the Zoe is whisper quiet at speeds under 20mph but does make a slight bit more noise as you pick up the pace. The soft seats offer lots of support to counter the car’s firm ride quality, while the car shares its dashboard with the Clio. Renault has added a brand new digital TT display which we think looks great. Is the Renault Zoe practical? It’s certainly a small car, but the brand has done a commendable job of getting as much space out of it as possible. It’s well-packaged, roomy for a supermini, with head and legroom adequate for most adults. It’s actually bigger than the Clio, and because its battery pack is located beneath the rear seats, the boot measures a respectable and competitive 338-litres. That’s far bigger than the Smart ForFour ED, and a low loading lip makes it easy to use. Is this the best Smart car yet? Possibly – but it’s also the most expensive. If, however, you know the price of everything and the value of everything, you might think it’s worth a shot. After all, it’s got style, a nippy engine, a real upmarket feel inside, and it’s super easy and even fun to drive. It’s green-minded, too. What’s not to like about the brand new Smart ForFour ED?